This is Garrett Smith’s brilliantly simple table support for heavy backpacks that doubles as as a massager for back ‘knots’ caused by heavy backpacks! Or… purses? Perfect for all of us ladies with the giant ever growing purses and those silly table hangers barely hold them up sometimes (not that i’d trust my dslr to be suspended in a busy restaurant by one! )… And the massager option is so nice… except for the part where you’d need someone with you to help implement it properly? 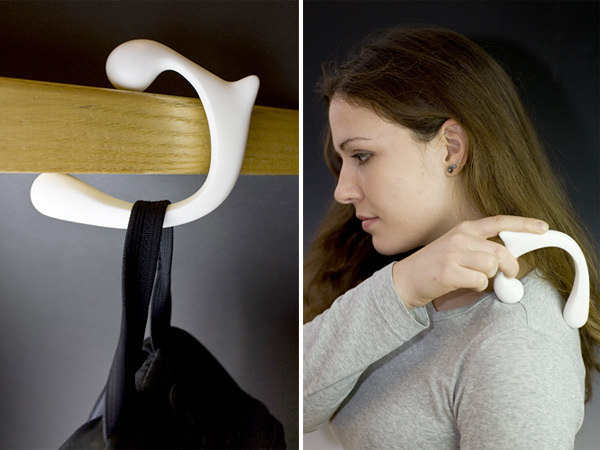 Anyhow ~ this is one of many fun projects being shown by SAIC in Milan this year! 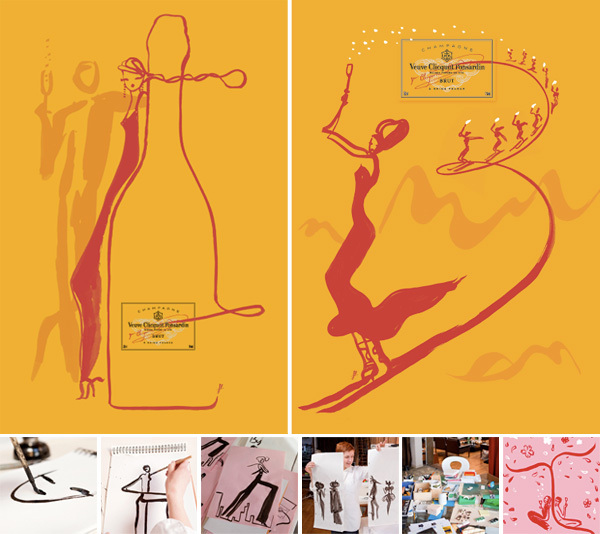 Ooooh a behind the scenes look at the work of Florence Deygas for Veuve Clicquot. Deygas is also the creator of the adorable Caprino & Peperone, those two doggies that are the Colette mascots!!! I love the beauty and simplicity of her brushstroke paintings ~ and it’s no surprise that she’s collaborated with Veuve Clicquot so many times. (Here’s a peek at an installation video she did with them in 2007 ~ where her work looks nearly like lipstick on floor to ceiling windows illustrating the skyline below… See the video!) She has also collaborated with brands such as Fendi, Yves Sain Laurent, Nokia, Vogue and Lacoste. I was initially torn to have so many Veuve Clicquot related postings back to back ~ but realized i feel like i’ve found a kindred spirit in the VC brand ~ and their collaborations and support of incredible artists and designers consistently has proven incredibly inspiring time and time again. As far as brands go, i suppose i’d love to have NOTCOT take a similar route someday, finding new ways to not only help share incredible works we discover, but also help inspire, support, and collaborate with artists and designers we love! But until then… click through to the next page and see more of this latest collaboration between Florence Deygas and Veuve Clicquot, as well as a peek at the artist at work! Samsung has their new LED TVs out ~ you’ve probably seen the ads just starting here at NOTCOT, and i have a new surprise to show you related to that soon (more to come when i can share! )… but all you need to know for now is that Linhchi and i have been closely getting to know the hummingbird in their ads the last week, and i kind of love it, even as much as it spreads quickly from tv ads to our online ads to magazine spreads and more… I just spotted the advert at FEED and they highlighted that the CG was produced by NY based 1st Ave Machine who has done some very awesome work worth checking out. So, happy saturday, and enjoy this gorgeous CG spot ~ its like a crazy iridescent hummingbird with insect like wings and a mesmerizingly drippy gooey quetzal like tail? 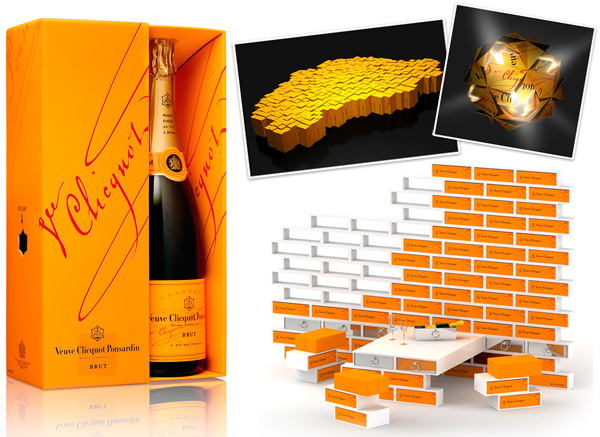 Veuve Clicquot is presenting Out of the Box at the Milano Salone del Mobile 2009 ~ and NOTCOT has a first peek at the goodies being shown! 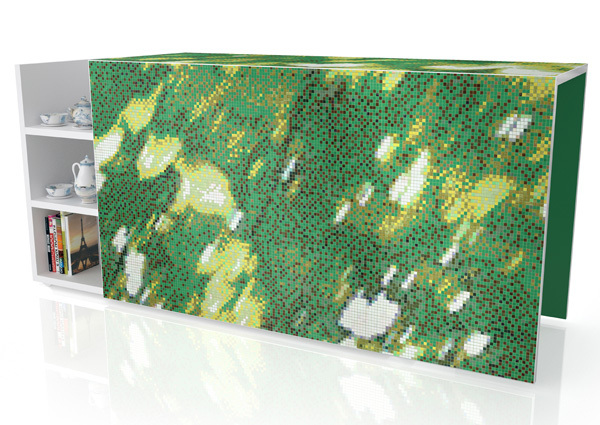 Their new DesignBox is an eco-friendly gift box ~ which they’ve put into the hands of Tom Dixon, Front Design, and 5.5 Designers to see what it inspired in them. These three collaborations come together at the SuperStudio Piu exhibition along with the Domus Academy (my alma mater!) Master in Design projects on Via Tortona, 27 from April 22nd through 27th. Above you can see renderings of Couch by Front Design, Lamp by Tom Dixon, and Cellar by 5.5 Designers. 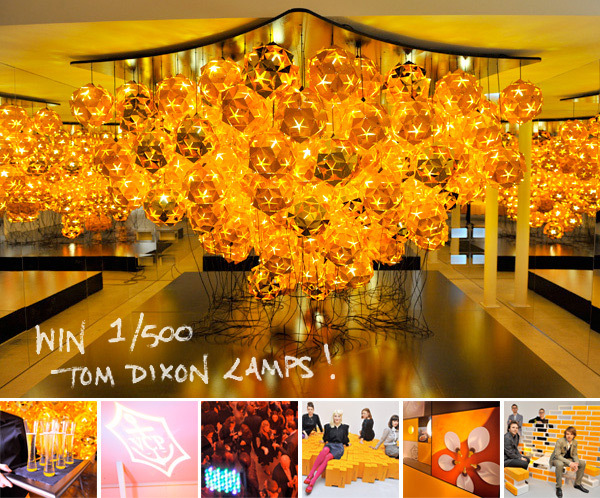 And on exciting news if you’re in milan… only 500 of Tom Dixon’s lamp have been produced and on day of the event 490 lamps (which are limited edition) will be made available to guests in Milan on a first-come first served basis!!! But for now, check out larger images and more info on the next page! i love that hexagon logo shaped hole on the side of the box that says PUSH. I really wanted to name this post “Look, mom! NO GLUE! or INK!” ~ but that seemed too silly ~ but this is definitely a packaging post ~ and much like that super fun Jurlique box a while ago ~ it’s all nicely cut efficiently folded box design! NO GLUE! and in this case, also, no ink ~ but just cardboard and foil application! On both the main box and the minis! As for the packaging designs with no glue and no ink ~ it’s the brain child of Marc Atlan, art director extraordinaire with a flair for fragrance packaging (he did Comme des Garcons, Helmut Lang, and Yves Saint Laurent). So, what is it? 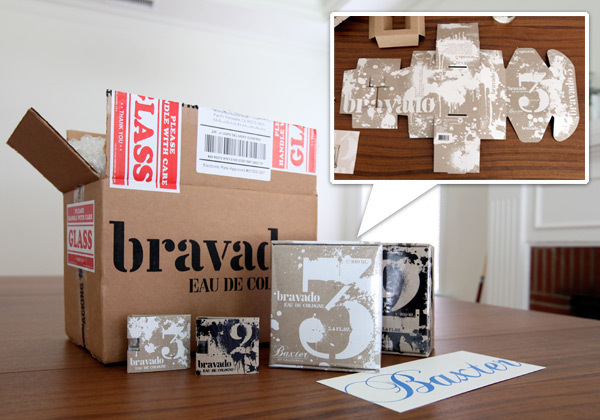 Well freshly dropped off are these new Baxter of California Bravado Eau de Colognes ~ Bravado 2 and Bravado 3. The original Bravado was launched back in the early 1970’s, but its been retired for over 7 years! So here are its latest reincarnations… But really, you have to check out the packaging on the next page! These will be available any day now in Barneys, and aren’t even on the Baxter of California site yet! It’s somehow becoming paper art week here at NOTCOT ~ after the many incredible artists showing at Papershapers, i just keep finding MORE! 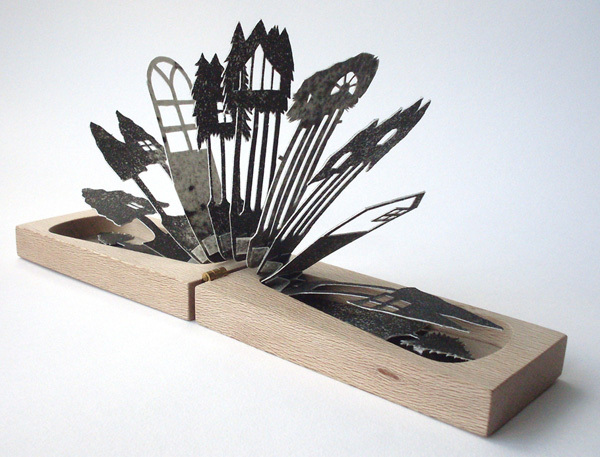 Late night obsessing over the 3D works of young British artist & maker: Lizzie Thomas! Her 3D micro-paper-sculptures unfold like pocket sized mythical worlds and forests tucked away in little hinged wooden boxes. One can only imagine the beautiful shadows they would cast on a wall if a candle was carefully lit beside them (perhaps this is where the paper aspect may not work as well?). You must check out more of the pieces on the next page, as well as an adorable portrait of the artist herself! Origamu ~ origami Mu Pan style (cut, fold, then paint!) 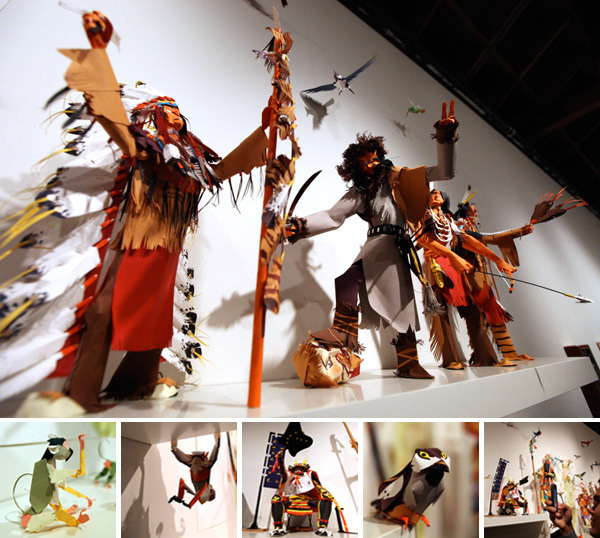 ~ was another extraordinary stand out at the Scion Space’s Giant Robot curated Papershapers show. This multitalented Brookyn based artist took the theme of historical and mythological characters from his paintings and had them take over the Scion Space ~ the looks of awe on the people crowded around them was equally fascinating to watch… And i just found his flickr of personal pics from the set up and of some of the characters in his yard! See more closeups on the next page! Hunter Stabler, your work literally made my jaw drop, and my xacto knife hand tingle a little… i think some of the most amazing art blows your mind in person even when you’ve seen a dozen images of the piece… and every time you walk by it grabs you all over again with new details. At the Scion Space last night ~ the Giant Robot curated Papershapers show was nothing short of epic, and every artist there could have easily been the only artist showing and it would have been incredible ~ in combination it was inspiration overload. But back to Hunter Stabler. OMG. The intricacy of his multilayered cutouts ~ the shadows they created ever so slightly lifted in their framing ~ the remnants and slightest imperfections of cutting and pen and pencil marks remaining were leaving the viewers in constant debate about whether he used laser cutters or xacto knifes (for the record, he’s a hand cutter)… and i must admit that seeing the pieces that weren’t cut out next to those that were, made me feel like they were unfinished! 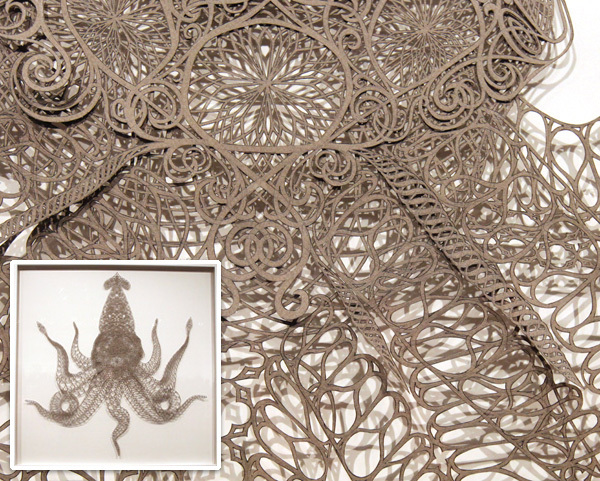 So take a look at some of his pieces from the show, and the DETAIL, it’s pretty amazing… pics on the next page! It’s been a strange and sleepless night ~ nurturing my budding jetlag, readers happen to catch me on facebook messaging, letting me know that Mark Hoppus reads NOTCOT… which led to the discovery of his octopus toy in the making ~ some twittering ~ much giddiness… and a sleepless morning of octopus obsessions and noticing how many octopi have appeared on NOTCOT.org and NotCouture! 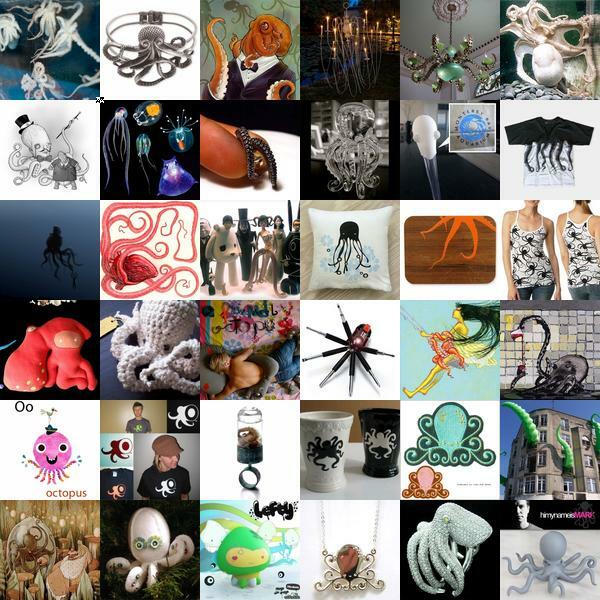 So, you know the drill ~ click those many octopi images to find out more! Sometimes i get distracted by the randomest details ~ my friend, freshly back from Photoshop World, was telling me to check out Gridiron’s Flow ~ and there’s even a free iPod Touch to every 50th download of their trial… but as i was checking it out, i got terribly distracted by how awesome the backgrounds and the flash animation on their homepage were… cute tagline “Chaos, meet Order”… so before i even downloaded the trial, and fully explored the program itself (which is in fact quite intriguing) ~ i was deep digging in their CSS to find all their various background files ~ which are SO cool! So take a peek at those on the next page, as well as some screenshots of their site (in case we ever look back years from now and their site is different?). Perhaps a NOTCOT first ~ scanning my junk mail? 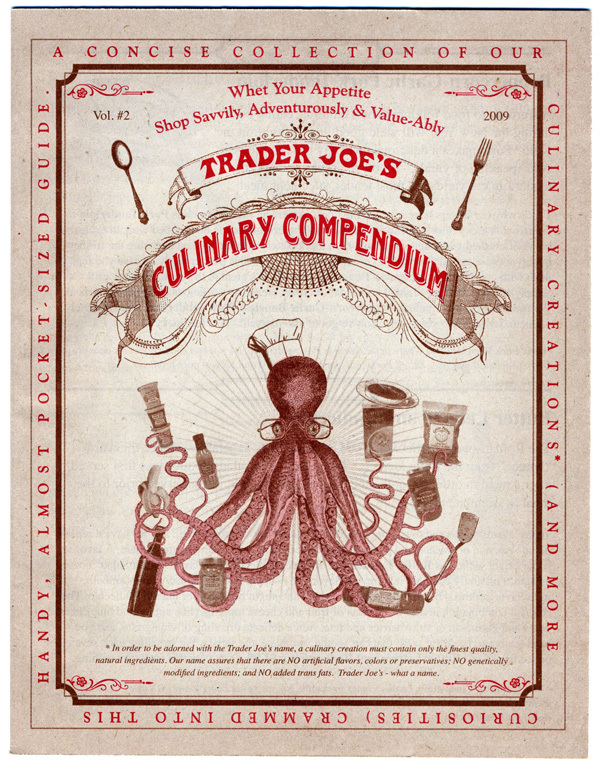 But flipping through this Trader Joe’s mailer was hilarious, you could just imagine how much fun the lucky designers were having as they put this together! The octopus on the cover is just priceless, and hilarity continues within as well! Take a peek at some of my favorite pages… on the next page! Just found the pdfs of the Culinary Compendiums are online! Check out my socal one here. So, WHAT is it? Well for close ups of the awesome invitation, check out the next page… and for more information on this upcoming collaborative art show this weekend, see The Send Help Project! Hosted by CreativeLab it will be in Brooklyn on March 28th (this saturday! one night only!). 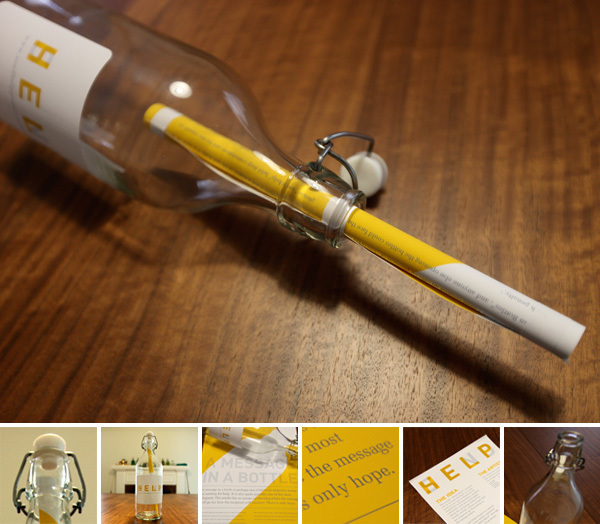 Artists will be exploring the theme of “SEND HELP” through various forms and mediums. Pics of the behind the scenes setting up the show, and even packing up these bottles are all on their blog… and for some fun closeups of mine, check out the next page! 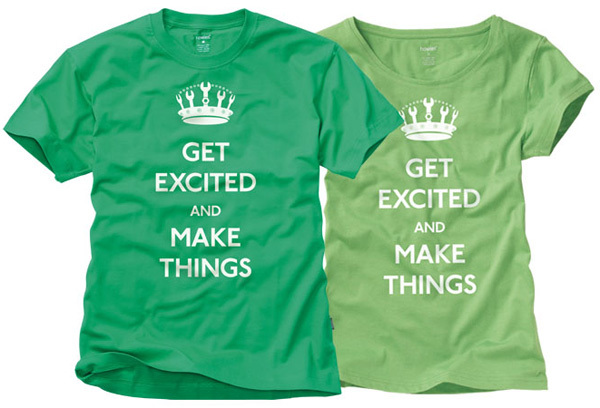 GET EXCITED AND MAKE THINGS!!! I can’t think of a better message for today… or any day! While there are far too many keep calm and carry on knock offs lately ~ this one just made my Friday. Love the Maker crown of wrenches and all! This is the latest of Howies T-Shirt of the Week ~ Made in Turkey, Designed by Matt ‘Black Belt’ Jones, and Printed in Westest Wales. Available in Mens and Womens!